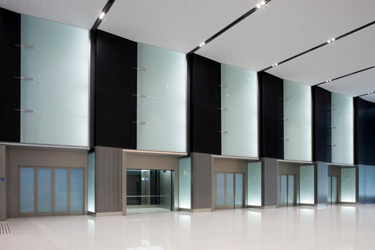 EMICA TECHNIK THE ORIGINAL MAINTENANCE CONTRACTOR for SMEC (Shanghai Mitsubishi Elevator company) equipment, has endeavored to provide professional services to ensure end-users’ satisfaction. Genuine Mitsubishi Parts Our spare parts, which are directly supplied and approved by SMEC, guarantee high performance, safety and reliability of your lifts and escalators. Comprehensive Inventory of Parts We keep the most comprehensive inventory of parts for SMEC equipment in Russia, Moscow. With this support, we carry out maintenance operation with the shortest downtime and minimum inconvenience to users. Quality Assurance and Control Our maintenance operations are closely monitored by experienced Shanghai Mitsubishi engineers from Moscow representative to ensure that the safe running conditions of the equipment are in compliance with SMEC standard. Professional Training and Technical Support With full support and technical training solely and directly by Mitsubishi, Japan, we offer effective and efficient total solutions in addressing breakdowns and technical issues of your equipment. EMERGENCY SERVICE HOTLINE Our 24-hour emergency callback centre provides all weathers round-the-clock emergency service to our customers. Once a call of elevator breakdown or a fault signal transmitted from the elevator remote monitoring system is received by the centre, our service team will be dispatched immediately to attend the breakdown call at the shortest possible instant. In order to achieve our high quality service and commitment, we have established strong emergency repair service teams which are supported by most experienced technicians. Teams are allocated at the South-West district of Moscow and closely work with MOSLIFT for the purpose of quick response to the emergency callbacks. With strong support from the original manufacturer, our professional, reliable and experienced emergency team members are specialized in Mitsubishi equipment and capable of addressing all types of technical problems efficiently and effectively. SAFETY SAFETY FIRST! Nothing is more important than safety The management of EMICA Technik treats Health and Safety as the number one priority in any situation. Central to all our policies and positions is our goal of improving public safety and protection for our employees from work-related harm. We develop our policies and positions using the best available evidence and member responses to consultations. 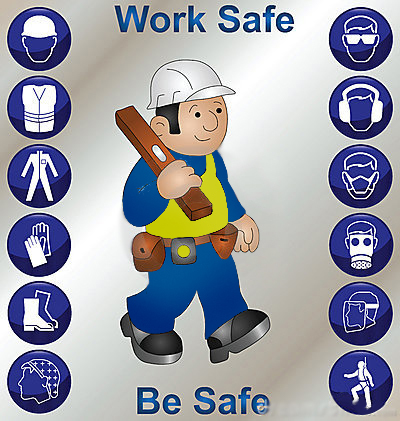 As a business EMICA Technik management understand their legal responsibilities with regards to managing Health and Safety and in order to demonstrate we undertake regular risk assessments to continually monitor that we are consistently using the most effective control measures and procedures. Press the call button once for the direction you want to go. Wait for the signal announcing your car’s arrival. Do not let the exit of passengers. Wait for the next car if the arriving elevator is full. Do not attempt to stop the closing doors with anything including hands, feet, sticks, etc. Wait for the next lift to arrive. Take the stairs in case of fire or situation that could lead to a disruption in electrical supply. Enter in car carefully. Passengers nearest the doors should move first. Came in, quickly press the button for your floor, and move to the back of the car to make room for other passengers. Stand clear of the doors, keeping clothes and carry-ons away from the opening. Stand back from the doors. Hold the handrail, if available. Pay attention to the floor indicators and be prepared to exit at your destination. If the doors do not open when the elevator stops, push the DOOR OPEN button. If the doors still don’t open, ring the ALARM button and/or use the telephone or intercom. Wait until qualified people can assist you. Do not force open the elevator doors. Do not attempt to leave the elevator. Push or pull the ALARM button to call for assistance. Phone for help, if a phone is available. An intercom or hands-free phone may be available. Follow the instructions for their use. Be patient – help is on the way. You are safe and there is plenty of air. So relax and wait for help. Don’t ride with canes, walkers, carts or wheeled vehicles. Don’t ride barefoot or with loose shoelaces. On escalators, watch the direction of the moving steps, and enter only when steps are going in the proper direction. Step on and off with caution. Take extra care if you are wearing bifocals. Hold children firmly with one hand. Grasp the handrail as you step promptly onto the moving step or walkway. Don’t use an inoperative escalator as a stairway. Don’t use an escalator to transport freight. 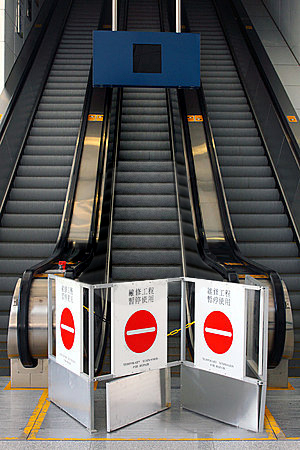 If you are uncomfortable boarding or riding an escalator, use the elevator instead. On escalators, stand in the center of the step and face forward. 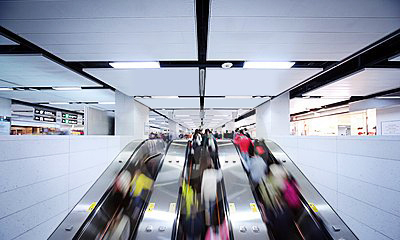 On moving walkways, stationary passengers should stay to the right and let those walking pass on the left. Keep feet away from the sides. Keep a steady grip on the handrail. Don’t rest your handbag or parcels on the handrail. Pay attention to the moving walkway—don’t be distracted by your surroundings. Don’t lean against or over the sides. Never sit on the escalator step or moving walk. Parents, make sure children ride in a proper manner. Don’t hesitate. Immediately move clear of the exit area—don’t stop to talk or look around. Other passengers may be behind you. Need assistance in finding the right product for your needs?